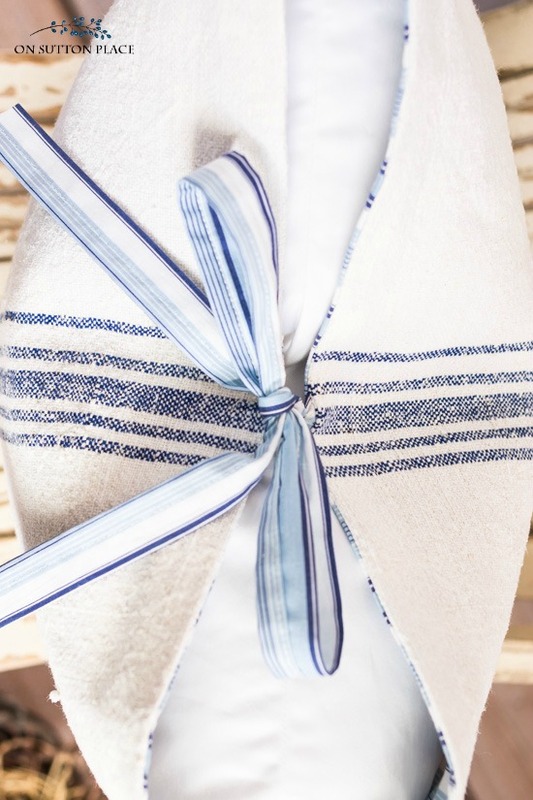 Learn to sew custom pillows on your own with this tie closure tutorial. 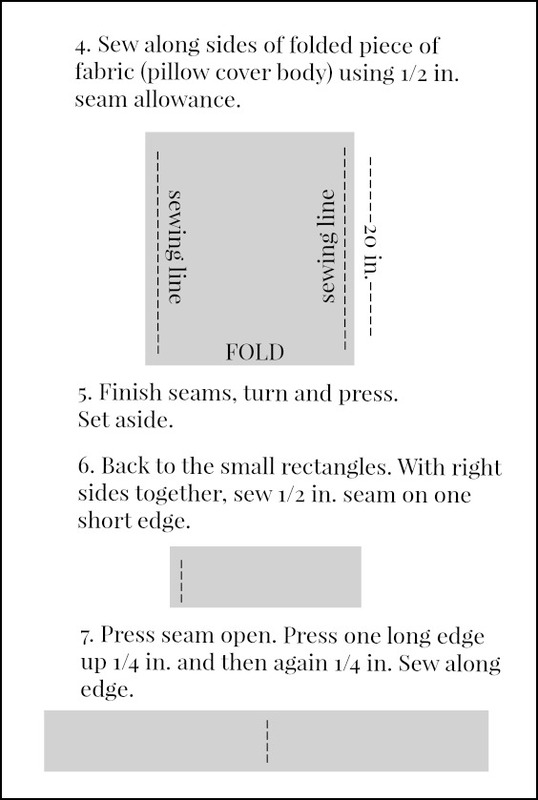 Includes step-by-step directions that are easy to follow. Only straight line sewing required! Pillows. Who doesn’t love them? They are, in my opinion, the universal go-to decorating accessory. Even if, secretly, you think they are a pain, chances are you still have several on your sofa! One of the prettiest sites ever is a sofa with 4 or 5 perfectly placed and puffed throw pillows. Switching out your pillow covers is a great way to change the look of a room…but it can be pricey. 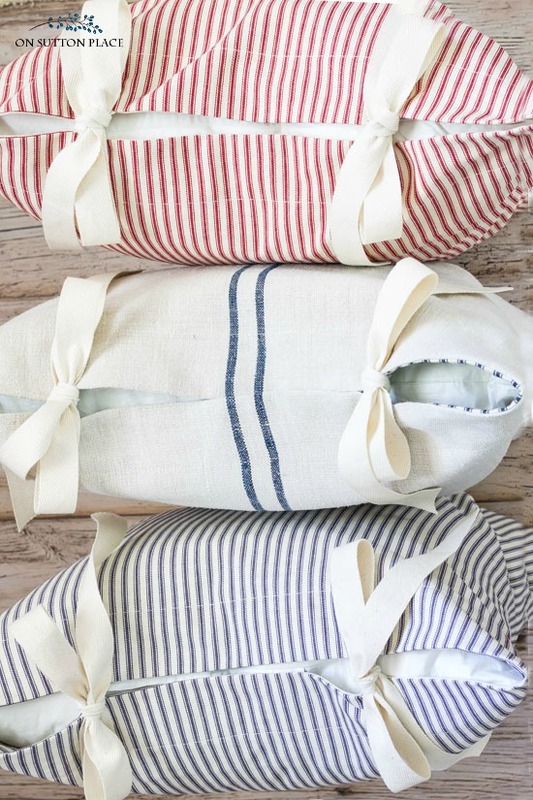 Custom pillows are not cheap…but if you learn to sew your own, the sky is the limit. I’m sharing how I make my own custom pillows, so if you have even a lick of sewing skills, you can learn to sew your own. 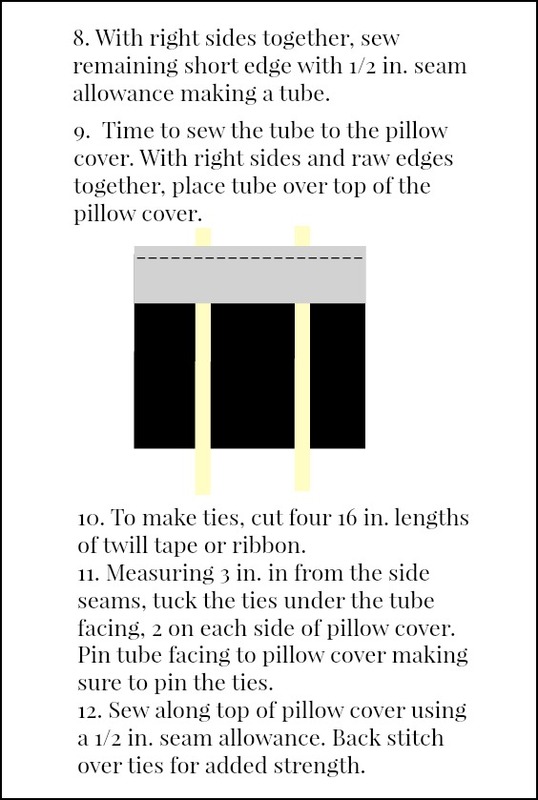 This tutorial is for a 20 x 20 pillow cover, but I am including the measurements for a smaller one at the end of the post. I use twill tape for the ties, but ribbon works very well too. Basically what you are making is a bag with ties. 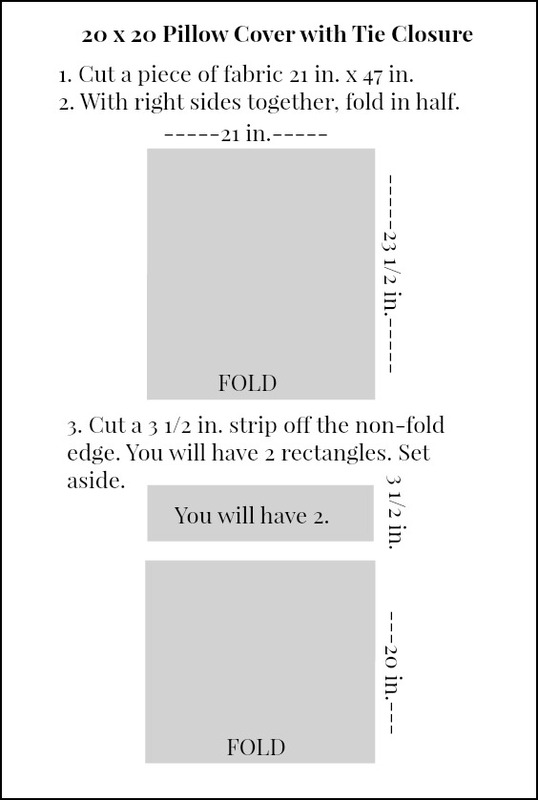 This is the exact method I use to make my tote bags. Depending on the look you want, you can use two different fabrics: one for the pillow cover body and one for the facing. Coordinate your ties with the facing. The distance between the ties is really a matter of taste. Put them where ever you think they look best. I have also made pillow covers with just one tie in the center. One piece of fabric measuring 19 in. wide x 43 in. long. About 2 yards twill tape or ribbon. 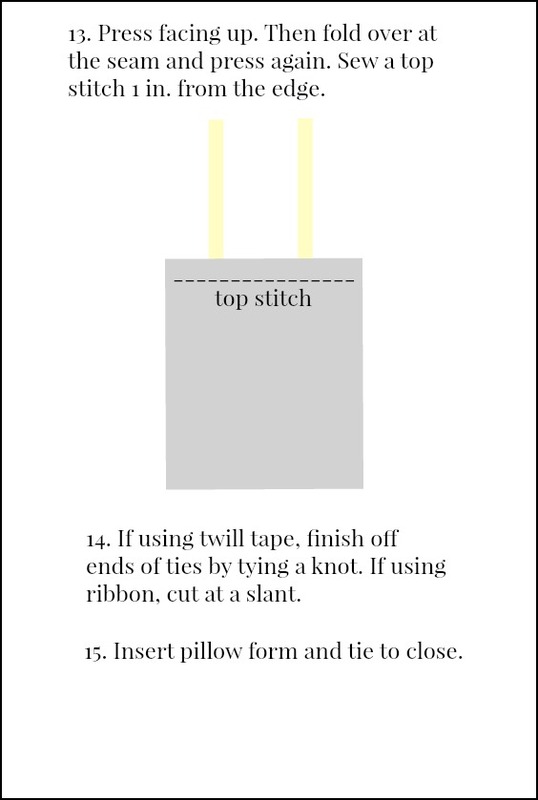 Click for more pillow tutorials! If you have any questions, feel free to leave them in the comments. See you soon! I so love these pillows with the tie closures! Your pillows are indeed stunning Ann! Have a great week! I usually make the envelope style pillows (mostly because I hate zippers!) so I made this one of yours the other day and love it! I used rope to tie it off since it was nautical themed fabric and I think it turned out great. I’ll be doing more this way. Many thanks for the tutorial! I am going to make several of these for summer! Thanks so much for the great tutorial, Ann! Pinning! Geez! I wish I had a sewing machine because I want to make some of these pillows! I adore the tie closures! Love this tutorial! Can’t wait to make some pillows! Perfect directions Ann, and I also love the contrasting facing fabric you used. Very inspiring and for my money easier than a zipper. Although, I’m a bit lazy and use an envelope back most of the time. But am make my next summer pillow your way. I have this ticking material in my closet not knowing what to do with it…Now I know & it’s such a wonderful idea…Thank you so much for sharing!! Thank you so much Ann for sharing this well-written information. You work is always so nice. Thank you so much! Well, I think I will try but rest assured mine will not be as nice as yours. I have been wanting to make some covers for my porch pillows and I think this works for me. Thanks for the tutorial Ann…..
It’s great to be able to “summerize” some of the wintry looking pillows. Although, in my house, I love living with ticking all year round. It’s so good of you to share your knowledge and ideas. Thanks for the tutorial, so clear and concise. Hope all is well. Thank you! You are always so concise on instructions, I think I might be able to do it! Love tied pillows! Thank you Ann! Pinning!! Thank you for the clear, well-written directions. You always inspire me to sew, cook, decorate, etc! Truly, I enjoy your blog. Also, I look forward to ‘shopping’ again – after you’ve added more items to your online shop. Soon, I hope. You are so (sew?) right. Pillows can be a real “go-to” décor element. And I plead guilty to ignoring them. It occurs to me that I have piled up in my sewing room probably 5 or 6 old pillows which need rehabbing. There’s no excuse, except lack of inspiration, but with Spring, I’ll be taking down my thermal drapes in the living room, and the sad, old couch desparately needs brightening. 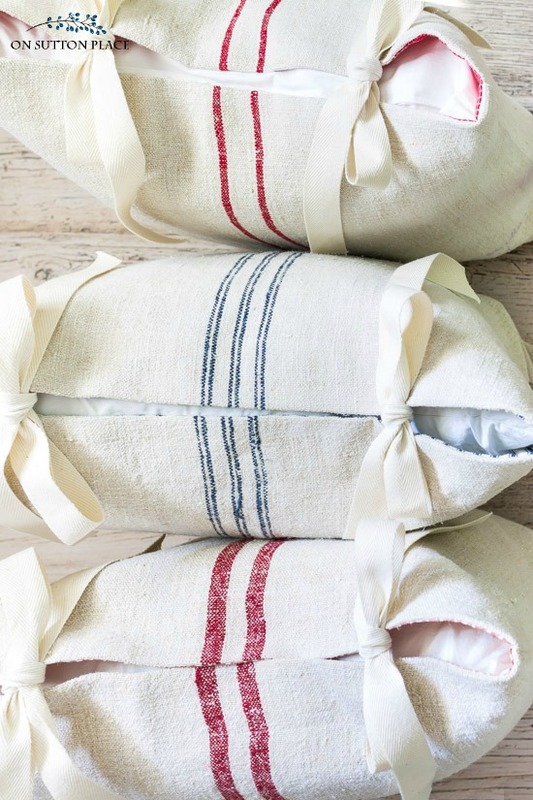 Okay, okay, I’ll put pillow covers on my to-do list…. That is fabulous Ann! Perfect tutorial.